The attached Budget Proposal reflects a review of, and recommendation for FY 2014, the 1,241 programs listed in the President's 2012 Federal Budget Proposal. 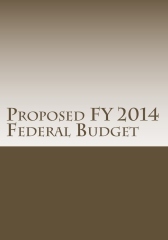 It includes proposals for Budget Reform, Entitlement Reform, Spending Reform and Tax Reform. The last two Budget Proposals made by President Obama have failed to obtain a single supporting vote in the House of Representatives or the Senate. If this Proposal is submitted to a vote in Congress, it could hardly do worse. The Budget is balanced in the year after implementation. The Budget provides for $2.5 trillion in direct consumer/business stimulus in the first year. The Budget stabilizes Social Security. The Budget gives States back control over their land and citizens. The Budget reduces the Federal Debt every year after implementation until fully repaid in 2030. I hope you will give this Proposal serious consideration. By law the President of the United States must present to Congress his Budget Proposal in the first week of February each year. Like previous years, President Obama will be late again this year. Over the last three years the Congress and Administration have managed to spend in excess of $12 trillion dollars, 1) without a budget plan and, 2) while adding over $4 trillion to the National Debt. The President’s Budget forecast expects GDP to grow much faster over the next 5 years than it has over the last 5 years: 23.46% vs 6.63%. If his spending projections over the next 5 years remain and the GDP only grows as fast as it has, then his future spending will hit 34.69% of GDP. Discretionary: Those that have become part of the expected activities of the government but not considered as such by the Founders. The President's 2012 Budget Proposal allocated $4.79 trillion in spending, over $1 trillion more than the $3.796T the President claimed and the press dutifully reported. Using current spending as a baseline and adjusted using three factors: 1) if it has substantially diverged from previous spending levels with no apparent change in responsibilities I returned it to previous levels; 2) if a function had management or supervision responsibilities over programs that were being otherwise cut, I reduced that budget by an approximation of potential savings; 3) if I reduced the responsibilities or scope of the program, the budget allocation was reduced by an amount I considered reasonable. Each program must justify it's entire budget each year. Entitlement spending is, and has been, rising much faster than inflation for years. With boomers retiring and the economy stagnating the problems with entitlements are just getting worse. Fastest growing part of the Federal Budget and the least in control (Obamacare will not change but accelerate this), the current debate is whether the government should be paying for lifestyle choices. Right now, hospitals are functioning on 54% of the revenues they bill. By offering the following and managing a 75% consumer participation rate, hospital systems would receive approximately the same revenue as their average expenses. On average, each adult pays $140.39 and each child pays $46.80 per month (varies from state to state – See Appendix B). Premium payment is made to the hospital of the adults choice and could vary from hospital to hospital (allowing for competition). All hospital care, either outpatient or inpatient is covered 100% for plan members. Hospitals establish a fixed daily cost for non-plan patients (same for inpatient or outpatient). The Plan includes a Medicaid grant from the Federal Government set at 25% of the 2010 total expenses for each hospital. Like to the Hospitalization plan, doctors and other general health service providers could begin offering a similar plan to their patients. The cost might be as low as $7.25 per month per person. Combined The Program and Plan create incentives for people to participate, for hospitals to manage costs and focus on patient retention and for both parties to manage health care. Consumers have the ability to change hospitals and doctors that fail to live up to their standards or who don’t manage costs well. We don’t have insurance for oil changes, or replacing tires, bulbs, filters or painting the siding. We maintain our homes and autos, provide the fuel and energy needed to run them. We have car (and homeowners) insurance to protect us from the rare events that cause their destruction or loss. Sold as a safety net or supplement to retirement plans, Social Security has become THE retirement plan of millions. The only problem was there was no ‘fund’, no lockbox, no account somewhere with all the social security taxes on deposit. Everyone 50 and older: no change in the payout system with the current retirement ages remaining. Those 36 to 49: A prorated payout at retirement. Those 35 and younger receive no benefits. And what of the tax rate? Zero. For everyone. No more social security taxes paid by the taxpayer or their employer. We allocate $1.67 trillion per year from the general revenues into a Fund that pays out benefits as needed. Until needed the funds are to be apportioned to each of the 50 states. The funds are provided to State-Chartered Banks or Savings and Loans that were chartered or established by and operate within the state. The funds can only be loaned out on a one for one basis. The loans can only be for primary residence first mortgages. They can only be made for 75% loan to value, to a maximum of four times the median state income and they must be made at fixed 5% interest. The institution must service the loan, it can not be placed with another institution, sold to or managed by any agency other than the originating lender. The loans must be made to residents of the state the funds were provided to. The institutions must pay 4.25% of the 5% interest to the United States Treasury. The remaining .75% is for the institution to service the loan and profit. The Third Rail interest earnings can be used for only one purpose: paying down the principle of the National Debt. On January 1st of the first year: All federal tax collections cease for one year. Consumers would have almost $2 trillion extra to spend and employers would have almost $500 billion for hiring, purchases and investments. The budget has two components, each will have its own revenue model to support it. $15 per person residing within the State. A national sales tax of 7.30% on all retail sales except food. There are no deductions from income prior to the tax, however, each person that earns wages will be able to take a $1,750 tax credit. This effectively exempts the first $10,295 worth of each worker’s income. If you receive all your income from interest, dividends and capital gains, you would not receive the tax credit. There would be no business income tax, no social security or medicare taxes, no estate taxes and it eliminates excise taxes. Tax returns would be one-page and take home wages should go up noticeably. The Federal Government is not a bank or the lender of last resort. All departmental Inspector General positions eliminated. As Attorney General Holder has proven, even the Justice Department IG is susceptible to political whims, but there is no reason to have 18 IGs doing basically the same job. An IG in the Special Counsel's Office of the Justice Department will provide services. As the WCF grows it creates a bureaucracy within itself that mimics the problem it was intended to solve and it hides the actual cost of individual programs. The accounts are eliminated. Associated with WCFs is the idea that Departments within the government pay market rates to the government agencies that provide them services paid for either directly or though the WCFs. If the government is going to mandate that 'market rates' be charged for government to government services, then the markets should be free to compete for the business of providing the services. Afghanistan: There is a timetable, keep it or move it up. Diego Garcia: A forward supply point for the Asian sub-continent, Eastern Africa, the Middle East and Western Asia. Many military installations overseas provide significant economic impact on surrounding communities, economic impact that is better delivered to communities surrounding bases in the United States. Allow the bankruptcy court to modify first mortgages the same way they modify other loans. All three parties to a student loan were at fault in creating such a situation: The colleges for tuition increases far beyond inflation or benefit; the lenders for not considering the earning potential of students that accomplish a degree; the students for living and learning on debt that bore no relationship to their future incomes. Allow student loans to be discharged in the managed and supervised process of the bankruptcy court. Leaving Medicare and Social Security the way they are now and keeping the rest of the cuts proposed would reduce the deficit, but the long term outlook remains bleak for those programs. And given the nature of the situation this Plan is addressing, NOT changing these programs would be considered a major failure of leadership. 1. The Federal Budget has two types of programs, those that are authorized under the Constitution and those that have been authorized by the People's representatives in Congress in response to cries to 'do something'. I classify the first as Authorities and the later as Discretionary. 2. Programs currently within the Authorities side may in fact exceed the Constitutional mandate but some argument COULD be made for them: the Air Force is one such program. 3. Departmental Inspector General programs are terminated. A single Federal Government IG will be managed by the Department of Justice Office of the Special Counsel. 4. Programs currently with the Discretionary side may in fact be necessary for a functional society: nuclear waste disposal programs are one type of such programs. 5. A significant number of 'independent agencies' has grown within the Discretionary side that belong supervised within Authorities. Independent is not a description of a program paid for and managed by the Federal Government. 6. Entitlement programs, which I broadly define as payments or services provided by the Federal Government to individuals either directly or indirectly are all Discretionary programs. 7. Programs that benefit a single state or several closely associated states should be paid for and managed by the state or group of states: the hydro-electric utility services of the West and Pacific Northwest are examples. The Tennessee Valley Authority is another. 8. Budgets are a necessary guide for the management and spending of taxpayer monies. No government program or service should be allowed to function without a written and signed Federal Budget prior to the beginning of the Fiscal Year. 1. Housing programs are terminated. If a state needs or wants to provide housing or housing assistance it can do so. 2. Food programs are to be phased out. Only Food Stamps and Child Nutrition programs remain and only for two budget cycles. 3. Medical programs are eliminated and a single annual block grant is provided to the states for assistance to elderly and chronically ill citizens. 3. No funds are allocated or disbursed to those 34 and younger. 8. 4.25% of the 5% interest is returned to the Federal Government for National Debt reduction. 3. It is expected that loans will be primarily made to refinance existing Federal Government Agency owned/managed loans. Principle write-downs are anticipated. 3. Any annual cost of living or other inflationary increase in payout amounts must be matched by and similar percentage increase in the annual payment made from general revenues. 4. Social security will self-terminate as the last survivor dies sometime around 2080. Any remaining funds are returned to general revenues. 1. Every program must renew it's justification for all allocated spending annually. 2. It is estimated that no program will need funds for continuing activities greater than the growth rate in population and a minimal inflation rate of 1% or less. Therefore spending is not expected to increase annually greater than 1.899% per year for programs retained and continued. 3. Working capital funds are terminated. 3. Terminated funds not sold will be 'zeroed out'. 2. Federal conservation lands are returned to the States for management/control. 5. Acreage is multiplied by the average state population density per acre. 2. Capital improvements for religious purposes are included. 5. States can collect the assessment amounts in whatever manner their citizens approve. 1. All proprietor will receive a $1,750 tax credit. 2. All interest, dividend, capital gains. 2. The flat income tax rate will be reduced to 12%. 1. Once the National Debt is paid, these funds and interest earnings from the Third Rail Fund will be returned to citizens in the form of a rebate check at the end of each calendar year. 2. During the Tax Holiday year. 2. Implemented during the current seated Congress (after the next elections). 4. Medical benefits of retirement programs are terminated. 3. Government advisory programs can be established with previous enforcement departments: No Child Left Behind mandates can be converted to 'Best Practices Research Programs'. 3. With the exceptions note above, all Federal Government spending will be for Federal Government employees and programs. Any program to be managed by the State will be funded by the State. 2. Must be an Authorities managed/funded program. 1. All foreign aid programs to groups, organizations and non-allied countries is terminated. 4. Aid programs require annual approval and can not be for recurrent events. 5. Food and health aid are to be by donation only – no monetary support for purchases by foreign entities. 2. Afghanistan is to be drawn down as planned. 1. Bankruptcy Reform: Make student loans and first mortgage liens modifiable under Bankruptcy supervision. 2. Federal Lending: Terminate all federal lending programs such as student loans and residential mortgages.